Fertile Ground is now accepting applications for volunteer opportunities in Assam! community development, organic farming and project management are also available. We expect to be offering internships on Vancouver Island in the spring and summer of 2017. Interested in learning about Vedic farming practices? Thinking about travelling to northeast India? 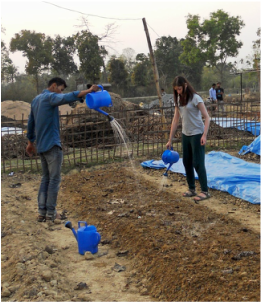 In 2015, we worked closely with Maina Dutta and Pabitra Borah to prepare lots of compost and nutrient-rich "compost teas" at the site of a new Organic Demonstration Garden near Jorhat. The centre could use some help from volunteers interested in growing and caring for vegetables, flowers, fruit and grains. Special attention will be given to planting out some of the area's traditional varieties. We're also offering opportunities for students and young farmers from the area to learn how to care for the soil, prepare low-cost, organic inputs, and develop marketing and entrepreneurial skills. For information about this exciting new program and how you could help out, click here! Watch a slideshow showing development of the garden! Our partners in this project are Kakojan College and the NGO NEADS. Funding has been made available through Rotary Clubs in District 5020, Fertile Ground and donors in Canada and the US. 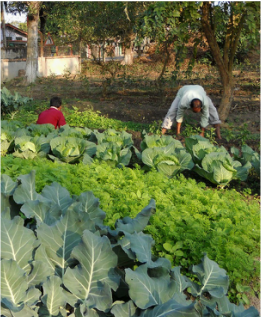 This 2 acre demonstration garden and resource centre is located in the small town of Digboi, and easily reached by train or bus. Staff members Babu Tanti, Iqbal Hussain and Suman Ghosh can always use a helping hand tending the garden and preparing traditional Vedic formulas used to improve soil and control insect pests. Click here to view a slide show highlighting activities that have taken place over the past 8 years. ASP's MANAGEMENT TEAM IS CURRENTLY ASSESSING VARIOUS REVENUE-GENERATING OPPORTUNITIES TO HELP SUSTAIN THE OPERATION OF THIS PROJECT. Funding for ASP is now being provided through Indian Oil Corporations' Social Responsbility Program. Rep's from IOC, Rotary Club Digboi, Axum Agri and Fertile Ground serve on the Mgt. Committee. This initiative was launched in early 2013 to raise awareness of the need to protect local and traditional varieties of vegetables, pulses, rice and other grains. The project is headed up by Mahan Borah, a young farmer from the Jorhat area. 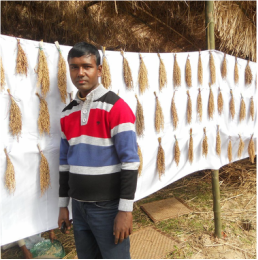 Mahan has planted out over 200 varieties of paddy (rice) and has collected and grown out important local seeds including brinjal (eggplant) and chili. If you want to take part in helping Mahan create a living seed "bank", or are interested in helping plan and organize training events, he'd love to hear from you! Axum Agri works to empower traditional farming communities by promoting livelihood security and the use of sustainable, environmental friendly agricultural practices. Based in Margherita, they work with farmers in several villages in the nearby area. Axum Agri is looking for people interested in sharing skills in producing compost, vermicompost and plant-based formulas with farmers and village members. To learn about Axum Agri's projects, visit http://axumagri.weebly.com or look for them on Facebook! For the past two years, Fertile Ground has provided training and encouragement to an enthusiastic group of young tea growers and farmers from villages close to the Bhutan/Assam border, in the homeland of the Bodo, one of Assam's indigenous peoples. A new demonstration garden and training centre is in the works - and the association who launched the project could use some help! Click here to view images of some of the Bodo growers and their gardens.